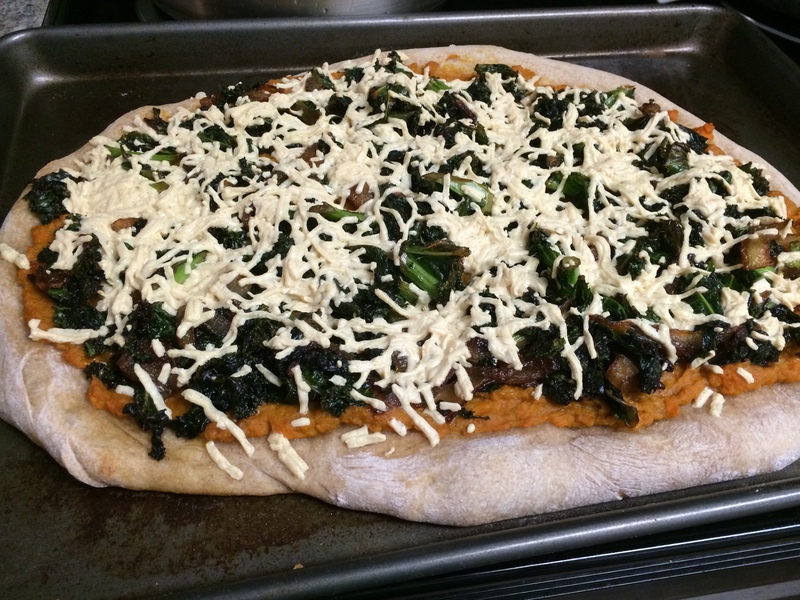 This was a new recipe I tried out for pizza night: and it was great! The difference was that it used a white sauce. 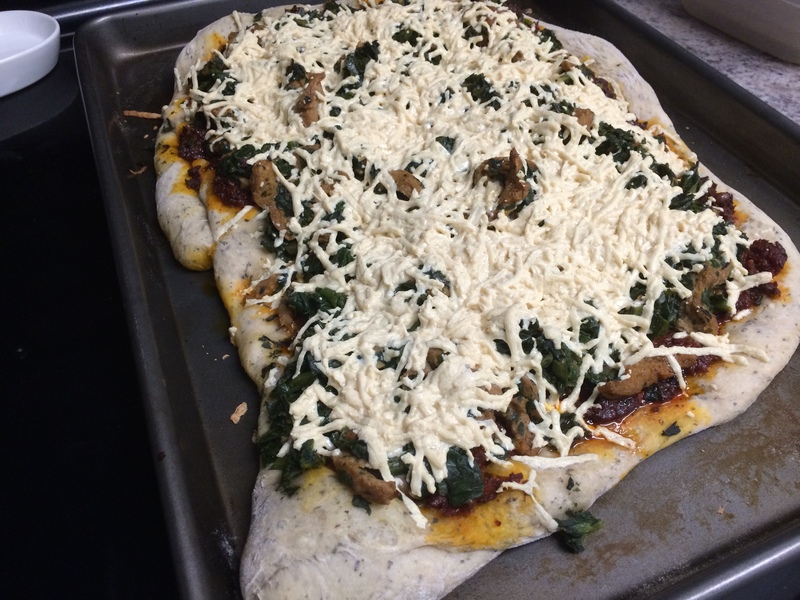 The sauce that I spread on the pizza dough was a mixture of 1 cup vegenaise, 2 tsp garlic powder, 1 TBsp oregano, and 1 cup daiya mozzarella. 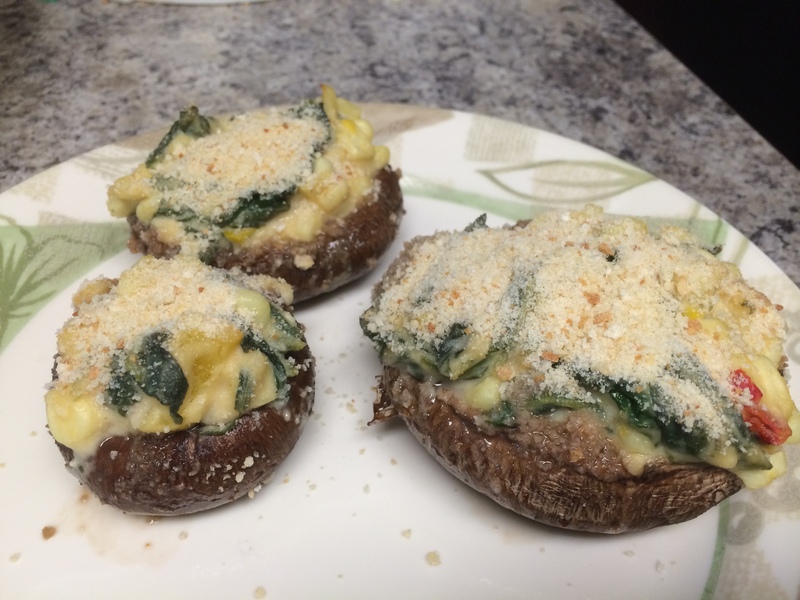 I spread this over some TJs Italian pizza dough, then topped that with fresh spinach as well as cooked mushrooms and artichokes, and lastly another layer of daiya mozzarella. This was baked at 425 for 15 minutes. Wow this pizza was jam packed and stuffed with so many great things. 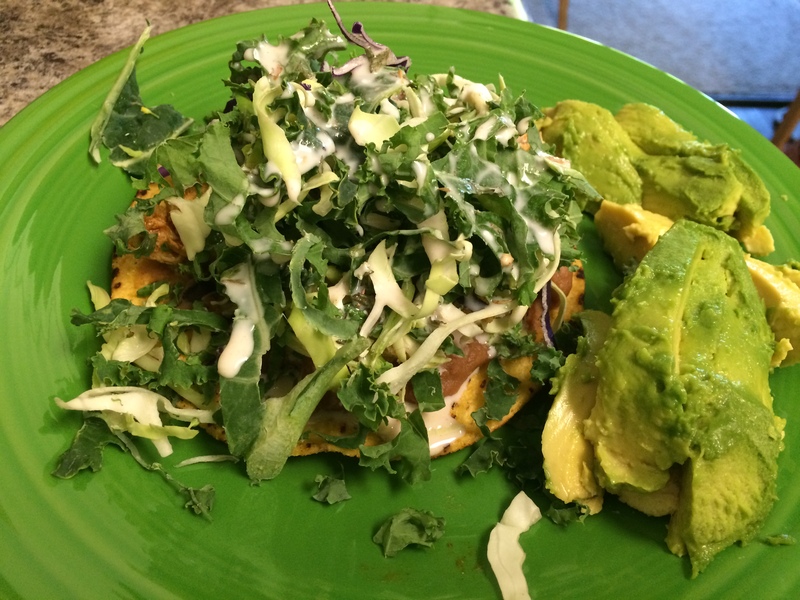 It just made me feel healthier as I ate it, and it was delicious! As is often the case, I used premade pizza dough from TJs. For the sauce layer I made my favorite pesto. 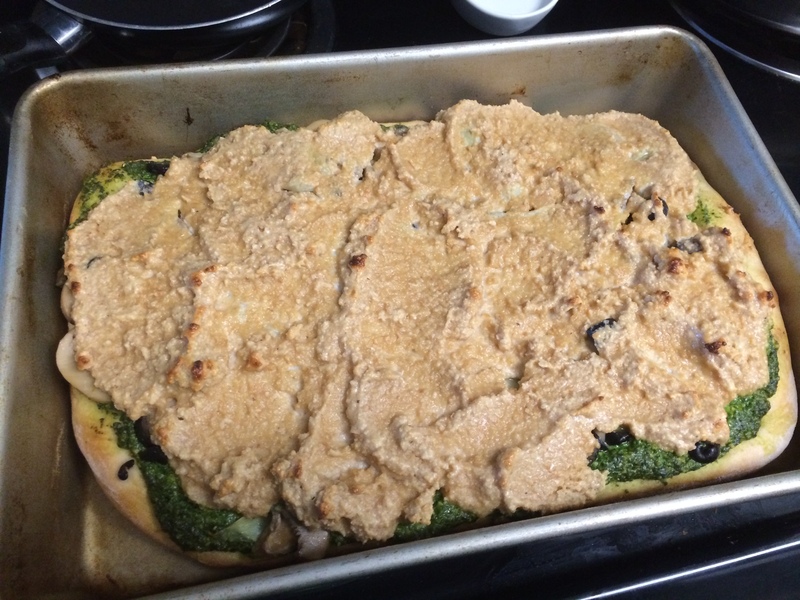 Basically I just pureed one package spinach, one package fresh basil, 4 TBsp garlic, 1/4 cup nutritional yeast, 1/4 cup pine nuts, and 1/3 cup olive oil. Sometimes it requires a little more olive oil. 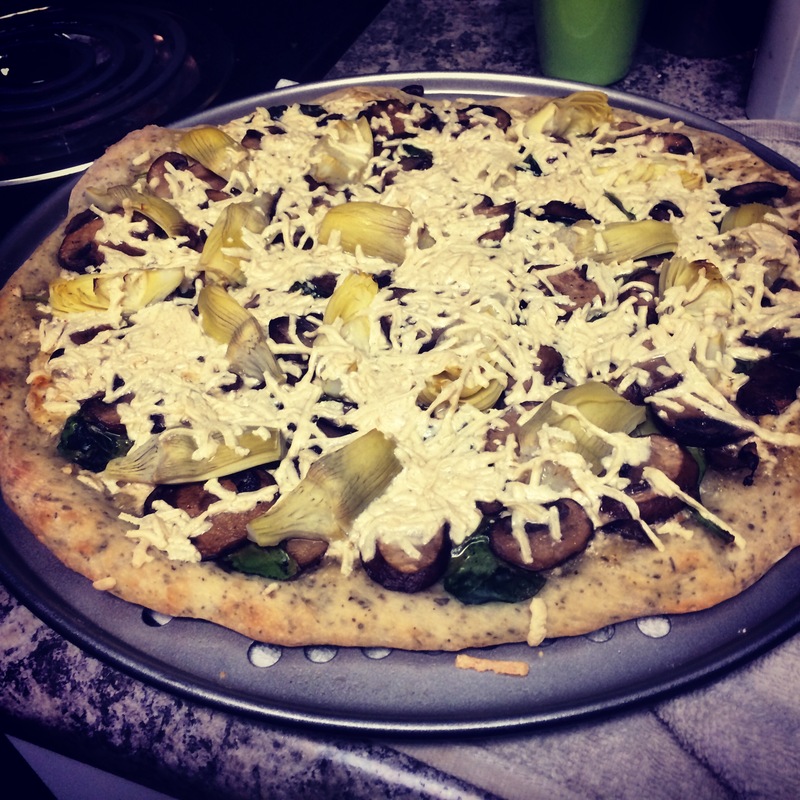 For the middle layer I topped it with olives, mushrooms, and artichokes. Then for the “cheese sauce” I pureed 2 cups cashews, 1/4 cup lemon juice, 1 cup water, and 1 tsp vinegar. Bake at 500 degrees for 18 minutes. I modified a gardein recipe for this dinner, super tasty!! The original recipe is here. My modifications were that I mixed a can of black beans with the refried beans. Then I also topped it with a kale and cauliflower mix and my favorite vegan ranch dressing. 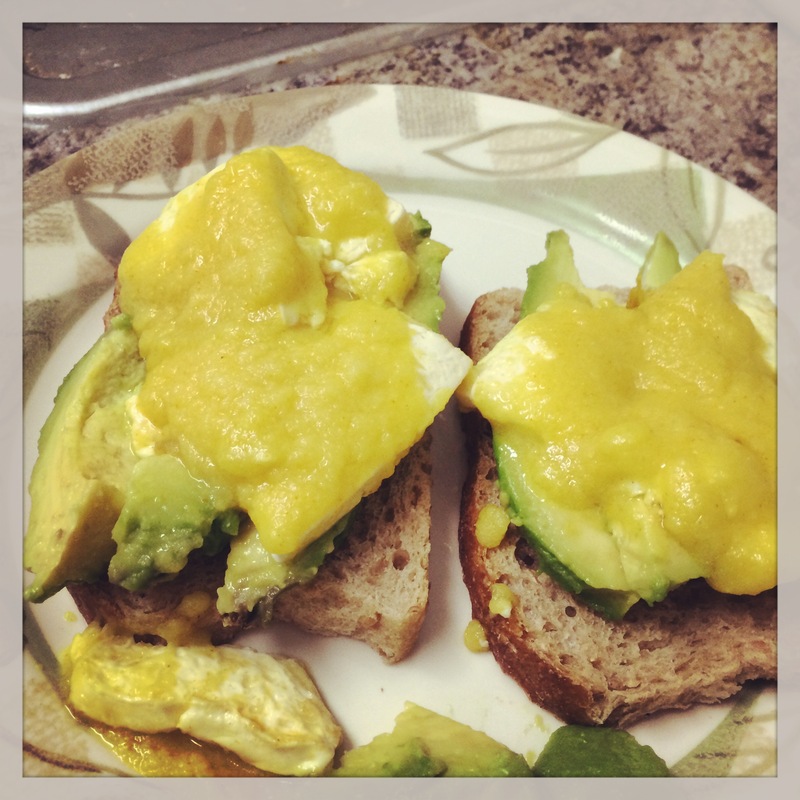 And of course everything is better with avocados added. This recipe was ok, but I am always a little disappointed with my attempts at making Indian food. It is never quite as good as I hoped , guess I just can’t do as well as the restaurant. But I will keep trying. For this one I chopped up a block of tofu and soaked it in paper towels for awhile to get the extra water out. Then I dusted the cubes with 3 TBsp cornstarch in a container. I fried the tofu in a little bit of canola oil and then removed. Then I fried some thinly sliced carrots and one chopped yellow onion in the canola oil. 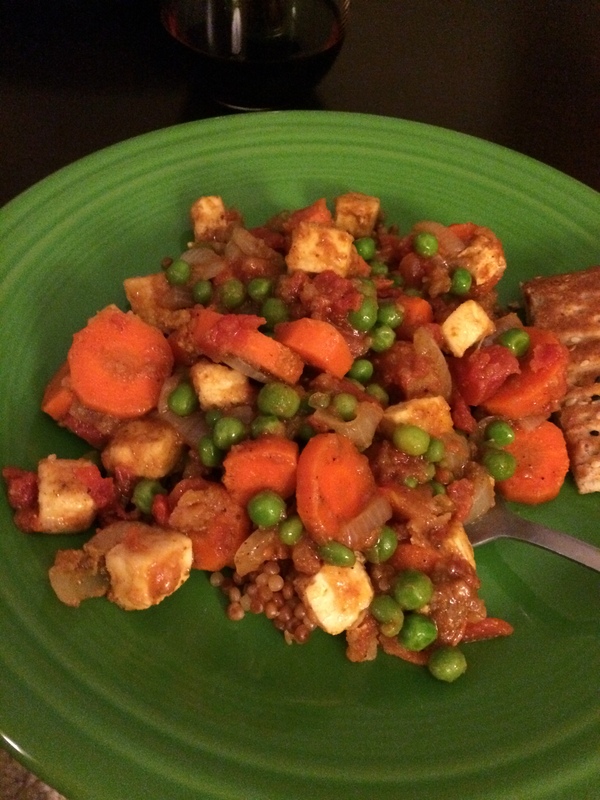 Finally I added 1 TBsp ginger, 2 TBsp garam masala, 1 can chopped tomatoes, 1 package frozen peas, and the tofu all back in to the wok, as well as a little bit (1/4 cup?) water. This was all cooked at medium heat for a bit and served over couscous. I wish it had been a little spicier. Next time I’ll add more spice. 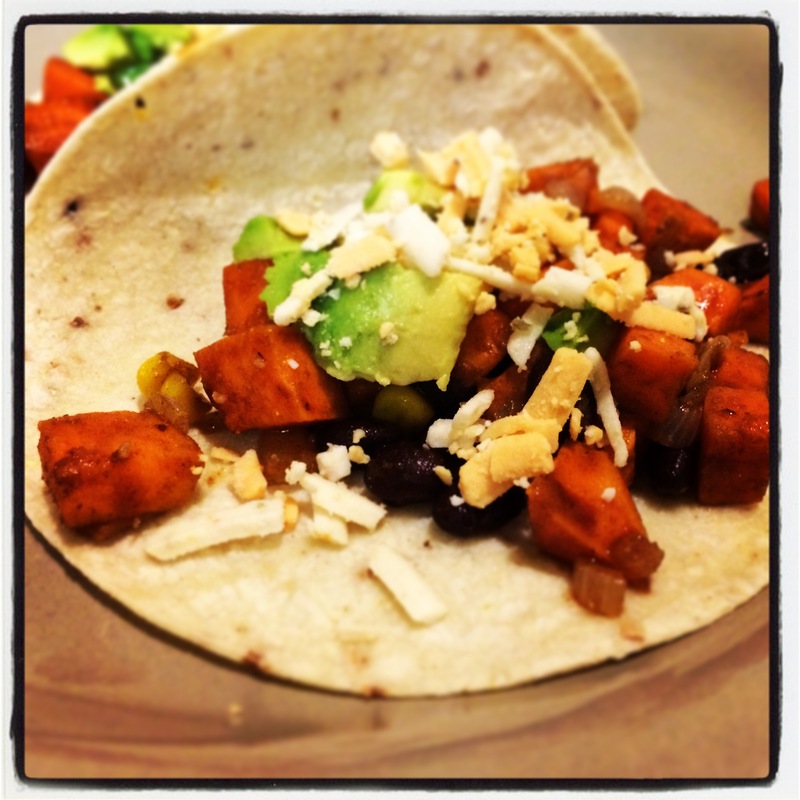 This one was a messy but delish simple taco recipe. First I diced a couple sweet potatoes. This was coated with 4 TBsp olive oil, 1 TBsp cumin, 1 TBsp paprika, 1 tsp coriander, and 1 tsp cayenne pepper. This was baked at 425 for 20 minutes. Then in a large skillet I fried up 1 chopped yellow onion in some olive oil on high. Once the potatoes were cooked, these as well as 1 cup frozen corn and one can of drained black beans were added. Then on low heat this was all mixed together and simmered with with 3 TBsp agave and 3 TBsp lime juice. Served on some tortillas with some vegan cheese and avocado. Have I mentioned I like pizza? Only about a thousand times, right? Well this recipe blew me out of the water. Get ready, this one is to die for. 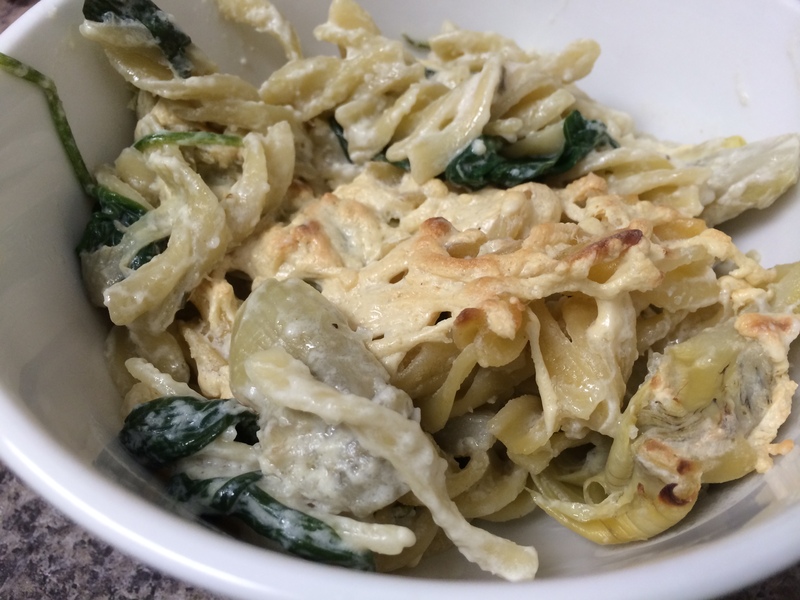 I once again found myself with a package of Toffuti Vegan Ricotta Cheese, and so found a recipe to veganize and tried it out with some other adjustments. I love pizza, maybe a little too much. So here was a great pizza that I threw together out of nowhere and realized after the fact that it was like a great stuffed pizza, almost a deep dish unintentionally. I have this continued habit of buying hummus cause it looks good, and then realizing I don’t really eat it or crave it that much when it is home…so then it sits there in the fridge until either I have a party and people come over to eat it for me, or I search for a recipe that will allow me to use it up. This is the latter. And this one let me use up a lot of ingredients. Sorry it’s been so long!! I have been super busy and now have a ton of recipes to upload for you all. I have been experimenting with vegan breakfast recipes recently, well a couple weeks ago now, and tried this one from Mouthwatering Vegan. Of course mine does not look nearly as good as hers. I pretty much made it exactly as the recipe called for, and sadly it was a lot messier than her picture. That being said, it was delicious on toast with avocado. And the silken tofu really did have an egg like consistency.